Free real IQ test. Get your IQ score fast and accurate: Instant Certified Free IQ Test - 5,482,997 Visitors since 2014. No Registration Required. IQ Test is based on 20 accurate scientific questions. You can share IQ Test result on Facebook instantly or view instant result (Without login / Email / Phone no / Credit Card). We have designed different IQ tests for different age groups. After these instant IQ test you can share your IQ score with other people on facebook and other social media. After these tests you can also find right answers with explanation. These are based on only 20 Questions. You can check your IQ level with in 10 minutes. Thanks for Visiting Instant IQ-Test.XYZ. 5,482,997 (Five Million Four Hundred Eighty Two Thousand Nine Hundred Ninety Seven ) Visitors have used IQ test since 25-12-2014. This site provided one of the best tests I could of asked for, I am very happy with the content the test gave and thought of the questions of the were suitable. This IQ System is as easy as XYZ Step . It is challenge to define Intelligence Quotient. We are doing our best to make our Instant IQ test unique and accurate. 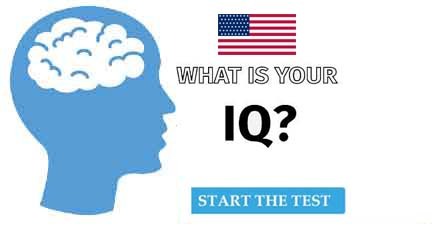 More than 5 Million people have checked their IQ Level using our scientific IQ test. You don't need to share your email ID , phone number or credit card information with us to get Instant Results. Its interesting part is that after this test you can check right answers with explanation. We have tried our best to translate IQ test in different languages. But we recommend you to take IQ test in english language. You can also check Right Answers with Explanation after test. This IQ test is completely different from traditional IQ Tests. Our IQ test is based on 20 scientific IQ questions. You can check your IQ level by just answering simple 20 IQ questions. There is no time limit to solve these questions. Very Low Degree of Intelligence . Trusted by 5 Million Visitors. Only 20 Questions based test. IQ Questions are In Simple English Language. No Time Bar to Solve the Questions. 100 % Free to Check IQ Points. No obligations, accurate online IQ test. Takes less than five minutes. After test you can Check your right Answers.